Pink Floyd will release a series of book-bound individual collections of the band’s seminal music from 1965-1972 on March 24, 2017. 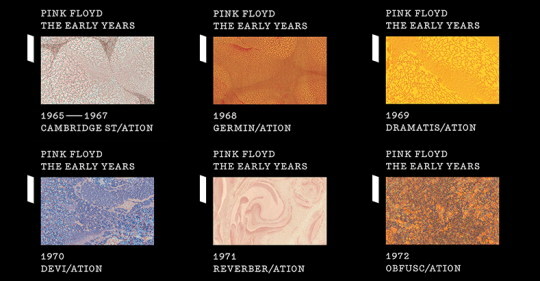 The 6 individual collections were first released as part of ‘The Early Years 1965-1972’ box set. Whether a fan of the early Syd Barrett era Pink Floyd, or to the final moments before ‘The Dark Side of The Moon’, there is something for everyone in these volumes for fans and newcomers alike. The stand-alone packages were originally released exclusively as the full ‘Early Years: 1965-1972’ box set that was reviewed as one of the best box sets of 2016 but are now available as separate volumes broken down by years 1965-1967, 1968, 1969, 1970, 1971 and finally 1972. Outtakes and demos from the band’s early albums including ‘The Piper at the Gates of Dawn’, ‘A Saucerful Of Secrets’, ‘Meddle’and ‘Atom Heart Mother’ are included in these packages.